Additional Information: See the Getting Started article for important deployment information. Since the 18.4 release of SentryOne, we offer support for monitoring AWS RDS for SQL Server. RDS for SQL Server is a fully hosted SQL Server instance, letting you focus on just the data and code within the database and not the hosting or caring of the underlying infrastructure. 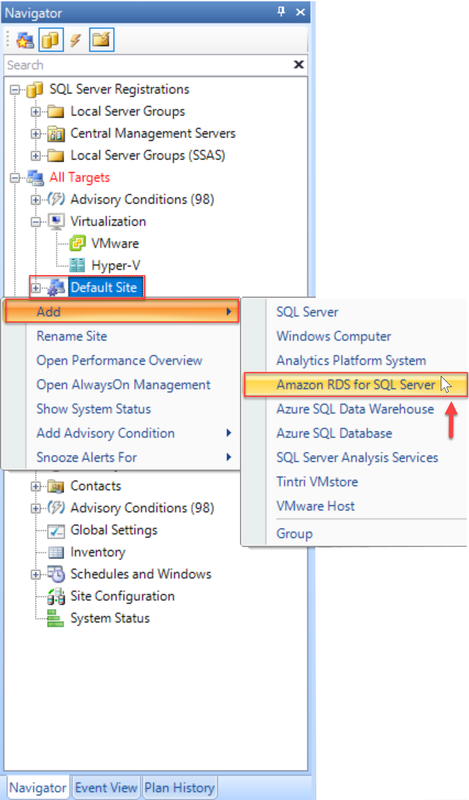 For more information about RDS for SQL Server, see the AWS documentation. Monitor waits, backups, transactions, latency along with other performance metrics in the Performance Analysis Dashboard. View Deadlocks, Top SQL, Index usage and, support RDS for SQL Server targets for our Advisory Conditions engine. The addition of SentryOne Advisory Conditions for SQL Server on RDS removes lingering concerns for performance management and process automation. Quickly define logic for a limitless array of automated performance tests, and take action ranging from sending an email to executing PowerShell commands in response to these tests. For more information about Advisory Conditions, see the Advisory Conditions topic. To add an AWS RDS for SQL Server target, install the latest release of SentryOne (v18.4+) from the Customer portal. For more information about installing the newest version of SentryOne, see the Upgrading SentryOne topic. The credentials provided for an AWS RDS for SQL Server target must be the Master User Account created for Amazon RDS for SQL Server so that full access is available for monitoring. The Amazon RDS for SQL Server instances must be reachable by the EC2 instance running the SentryOne platform software. Ensure that the database instance is accessible via a related security group on the database instance. For more information see the Amazon AWS documentation regarding Security Group Considerations. Right-click the desired site in the Navigator, and then select Add > Amazon RDS for SQL as the target type. 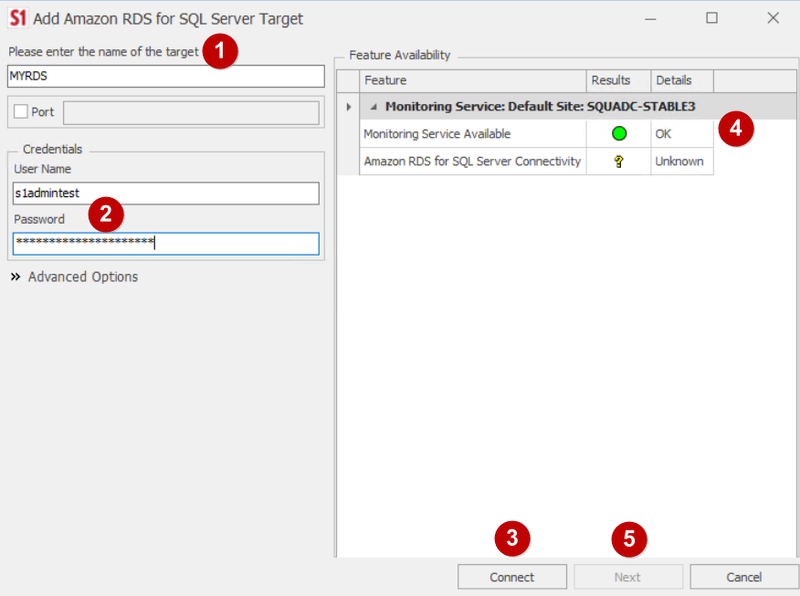 Next, complete the target information on the Add Amazon RDS for SQL Server Target screen. Enter the Fully Qualified Domain Name (FQDN) of the RDS target. Enter Credentials to monitor the RDS target. Select Connect to test feature availability and the connection. Wait for the green dot on Monitoring Service Available. Select Next to complete the process of adding an RDS target. See the Adding Targets and Instances to Watch topic if additional information is needed. Success: After adding your Amazon RDS target, it's available to select in the Navigator pane. Note: This is only a guide to adding an RDS target. For complete information on using SQL Sentry, continue with the SQL Sentry section.